The Historic Coast Guard Station at East Beach is currently closed due to ongoing site work in preparation for the new World War II Home Front Museum. For more information on this project, visit the World War II Home Front Museum Page. 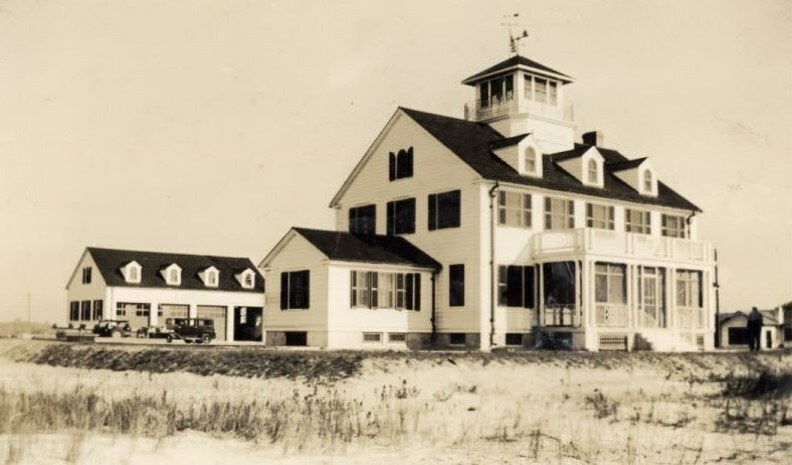 The St. Simons Coast Guard Station at East Beach was constructed as one of President Franklin D. Roosevelt’s Public Works Administration projects in 1936. Colonial revival in style, the standardized design was used for a number of maritime service structures along the American coasts. The Station’s “First Watch” was on April 1, 1937. At that time, the beach front was much closer to the front of the Station. A companion boathouse was later located on the Frederica River near the causeway to Brunswick. It provided a storage and maintenance facility for the Station’s search and rescue vessels. The original mission for Coast Guard personnel was to rescue swimmers, assist boats in distress, and log the passing of all planes and ships. The mission changed on November 1, 1941. As war in Europe threatened to cross the Atlantic Ocean, President Roosevelt signed an Executive Order transferring the Coast Guard from the Treasury Department to the War Department, under the auspices of the U.S. Navy. The Coast Guard was charged with establishing a system of shore patrols to detect enemy activity. The most significant life-saving effort in the Station’s history took place on April 8, 1942, when two merchant ships, S.S. Esso Baton Rouge and S.S. Oklahoma, were torpedoed by a German U-boat off the coast of St. Simons Island, killing 22 crew members. The Coast Guard immediately launched a rescue effort to save the survivors, who were brought to the Station for debriefing. The St. Simons Coast Guard unit continued to organize shore patrols until the war ended in 1945. On January 1, 1946, the Coast Guard was transferred back to the Department of the Treasury. Through advances in communications, the Station began monitoring all Coast Guard assignments by radio, especially “ship to shore,” and by telephone. The men continued to be housed at the Station, though they no longer had sea watch duties. The boats remained at the boathouse on the Frederica River. In the spring of 1967, the Coast Guard was transferred to the newly created Department of Transportation. Increasing automobile traffic on St. Simons Island affected travel time between the Station and the Frederica River Boathouse, slowing down boat launches for rescue missions and safety purposes. The Station was decommissioned in 1995, when Coast Guard operations moved to a new location near the Sidney Lanier Bridge. Ownership of the Station was transferred to Glynn County. The Coastal Landmark Preservation Society (CLPS), a local non-profit organization, was formed to protect and manage the site, under a license agreement with the County. Through the efforts of CLPS, the site was listed on the National Register of Historic Places in 1998. CLPS merged with the Coastal Georgia Historical Society in 2001. The main building was rehabilitated and opened as a maritime museum by the Coastal Georgia Historical Society in 2006. Plans are underway to create a World War II museum at the Station, interpreting local home front activities to defend the coast and support the war effort overseas. Since 2012, the nearby boat garage has served as a coastal archaeology laboratory. When the last of the Coast Guardsmen left the East Beach Station in 1995, they expressed hope that one day the station would be restored and become a museum. Under the direction of Coastal Georgia Historical Society and with donations from many generous benefactors that dream has come true.